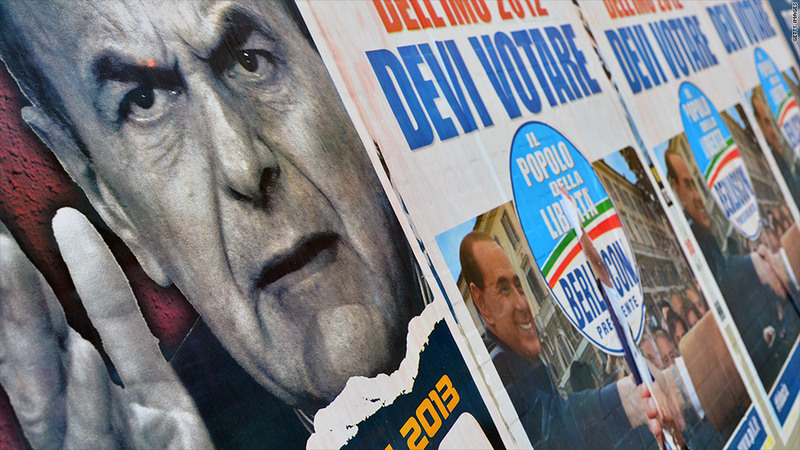 Italian voters handed narrow victory to center-left coalition of Pier Luigi Bersani in the lower house but backed populist anti-austerity campaigns led by former Prime Minister Silvio Berlusconi and comedian Beppe Grillo, creating a hung parliament in the Senate. Italy is poised for months of political uncertainty and a new election within a year as it deals with the inconclusive outcome of this week's vote. But as long as an interim government leaves previous reforms in place, it's unlikely to tip Europe back into crisis. Italian voters delivered a shock late Monday, handing a narrow victory to the center-left coalition of Pier Luigi Bersani in the lower house but backing populist anti-austerity campaigns led by former Prime Minister Silvio Berlusconi and comedian Beppe Grillo in greater numbers than expected, creating a hung parliament in the Senate. Investors and Italy's European partners had been hoping Bersani would build a new coalition government with former Prime Minister Mario Monti, who hauled the eurozone's third biggest economy back from the brink of collapse last year with a series of painful tax increases and spending cuts. The election result pushed world stocks lower and increased borrowing costs for Italy and other heavily indebted eurozone states. But while the uncertainty will add to market volatility, a combination of Monti's reforms and the European Central Bank's untested and conditional pledge to buy the bonds of ailing eurozone states could still give Italy enough time to elect a stable government. "We have already seen an initial spike in bond yields, and the markets are likely to ratchet up the pressure on Italy to find a stable and working political solution to allow a resumption of its economic liberalization reform agenda," said IHS economist Raj Badiani. Political analysts and economists expect Bersani to try to form a broad coalition government with a limited mandate to reform Italy's convoluted electoral system and political institutions, setting aside major economic decisions -- an agenda that could attract the support of all the major parties. "Italy is not in such a situation that we cannot afford to have a few months of political stalemate on major [economic] reforms given that a lot has been accomplished already," said Marco Valli, chief European economist at Italian bank UniCredit. "The top priority is to avoid any kind of backpedaling." Italy's government borrowing totals about two trillion euros, equivalent to around 127% of gross domestic product, a ratio surpassed in the eurozone only by Greece. Its economy has barely grown for years, unemployment is near 12% and rising, and living standards for many are tumbling. The country badly needs more structural reforms to restore competitiveness, boost growth and make a serious dent in the debt mountain. "There is a crisis in the sense it's going to delay all of that," said IHS' Badiani. But Italy is on track to start reducing its debt burden in 2014, according to the latest forecasts from the European Commission, and it has taken advantage of improved investor sentiment to cover 25% of its borrowing needs for 2013. "Italy is still in a better situation than when Mario Monti took over from Silvio Berlusconi in November 2011," said Azad Zangana, European economist at Schroders. "The key for Italy will be to ensure the progress made so far is not reversed, and to manage market sentiment and expectations." A critical first test of that will come Wednesday, when the Italian government looks to sell 3-4 billion euros of 10-year bonds. Market strategists say yields could rise still further, and may test the 5% level, but that would still be well below last year's peak of 6.6% when the eurozone debt crisis was raging.